Quantity discounts available. Please contact us for more information. This inflatable sink has many great uses. First off, it is collapsible and takes up very little space in any emergency kit, camping trailer, RV or trunk of your car. 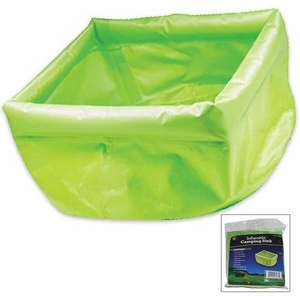 You can easily inflate the rim to unfold this camping sink and fill it with up to 5 liters (5 quarts) of water. Use it for sanitary purposes while camping or sheltering in place to wash hands or dishes. Use to rinse vegetables or fruits. Use as water bowl for your pet. If you don't need a sink, then use it as a bowl to store small items while outdoors or camping. And when you are done, simply deflate and fold up for storage. Shipping: This item might ship with US Postal Service or UPS.